The case revolved around the group’s on-going refusal to let their music be used in any commercial sense and Monster Energy hiring DJ Z-Trip to put together a Beastie Boys megamix to soundtrack a video on snowboarding. To complicate matters further, right before the end of the film, Monster acknowledged the group by putting the words “RIP MCA” in reference to the recent death of Beastie’s member Adam Yauch. The words were in a logo reminiscent of that of Monster Energy which the surviving members of the group, Mike Diamond and Adam Horovitz, felt implied that they endorsed the energy drink. Monster Energy fully admitted that they used the songs Sabotage, Pass the Mic, Make Some Noise, So What’Cha Want and Looking Down the Barrel of a Gun in the promotional film, so the trail really revolved around what rights they had to do so and, if they didn’t have the rights, how much they owed the group. Diamond and Horovitz were looking for $2 million, $1 million for copyright infringement and $1 million for implied endorsement while Monster felt that $125,000 should cover everything. The jurors sided with the artists, awarding them $1.7 million. 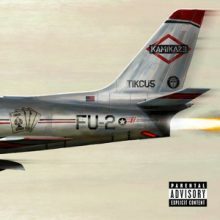 Eminem did not approach Beastie Boys before releasing a replica of their ‘Licensed to Ill’ cover for his ‘Kamikaze’ album. Eminem has a new album called ‘Kamilkaze’ and no-one knew about it until it dropped a few hours ago. Over 500 people came to Brooklyn Heights on Sunday morning for a peace rally brought on by the vandalizing of Adam Yauch Park. Trump’s Divided States of America is happening fast and ugly. Adam Yauch Park in Brooklyn was defaced by racist Trump supporters on Friday. The 30th Anniversary LP edition of Beastie Boys' debut album Licensed To Ill will be released on October 14, 2016. This special reissue was cut from the original production masters and is presented on 180-gram heavyweight vinyl. Before the Beastie Boys hit the big time, they had two other members, Kate Schellenbach and John Berry. The two only appeared on one recording by the group, their debut EP Polly Wog Stew.